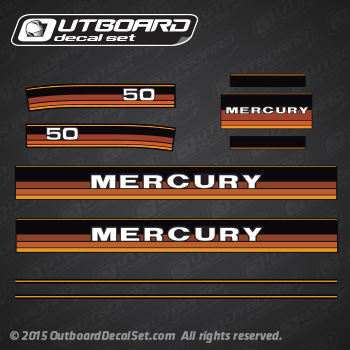 Replica of a Mercury 50 hp decal set for 1984-1985 Mercury Outboard motor covers. 1980 1050200, 1050220, 1050500, 1050520, 1050530, 1050550, 1050620, 7050200, 7050220, 7050500, 7050520, 7050550. 1982 1050202, 1050222, 1050502, 1050522, 1050532, 1050552, 1050622, 7050622. 1983 1050203, 1050223, 1050243, 1050503, 1050523, 1050533, 1050553, 1050623, 7050503, 7050523, 7050553, 7050623. 1984 1050204, 1050224, 1050504, 1050524, 1050534, 1050554, 1050624. 1985 1050205, 1050225, 1050525, 1050555, 1050625, 7050225, 7050525, 7050555, 7050625. 1045216, 1045236, 1045716, 1045726, 1045776, 7045226, 7045716, 7045726, 7045776.